The Solar Occultation for Ice Experiment (SOFIE) has measured nitric oxide (NO) from satellite since 2007. The observations are validated through error analysis and comparisons with other satellite observations. Calculated SOFIE NO uncertainties are less than 50 % for altitudes from 40 to 140 km. SOFIE agrees with other measurements to within 50 % for altitudes from roughly 50 to 105 km for spacecraft sunrise and 50 to 140 km for sunsets. There is a massive manifestation of atmospheric gravity waves (GWs) in polar mesospheric clouds (PMCs) at the summer mesopause, which serves as indicators of the atmospheric dynamics and climate change. We obtained a universal power law that governs the GW display morphology and clarity level throughout the wave population residing in PMCs. Higher clarity refers to more distinct exhibition of the features. A GW tracking algorithm is used to identify the waves and to sort the albedo power. The strong descent of wintertime mesospheric air into the stratosphere has been of great recent interest. Here, we show that because mesospheric air is depleted in methane, it implies that chlorine will be found more in its active form, chlorine monoxide. This is a new way for mesosphere/stratosphere coupling to affect ozone. Second, these effects seem to persist longer than previously thought. Studies of the summer upper stratosphere should consider the conditions from the previous winter. While global stratospheric O3 has begun to recover, there are localized regions where O3 has decreased since 1991. O3 in the mid-stratosphere is very sensitive to nitrogen chemistry, with increased NOy resulting in decreased O3. We show how the observed O3 changes in the tropical mid-stratosphere can be caused by long-term variations in dynamics. These variations result in a decrease in N2O, an increase in NOy, and a resulting decrease in O3. The Na layer in the upper atmosphere is very sensitive to solar radiation and varies considerably during sunrise and sunset. In this paper, we use the lidar observations and an advanced model to investigate this process. We found that the variation is mostly due to the changes in several photochemical reactions involving Na compounds, especially NaHCO3. We also reveal that the Fe layer in the same region changes more quickly than the Na layer due to a faster reaction rate of FeOH to sunlight. A total of 154 nights of observations by the USTC Na temperature and wind lidar (32° N, 117° E) suggest significant seasonal variability in the mesopause. Chemistry plays an important role in Na atom formation. More than half of the observed gravity wave (GW) momentum flux (MF), whose divergence determines the GW forcing, is induced by short-period (10 min–2 h) waves. 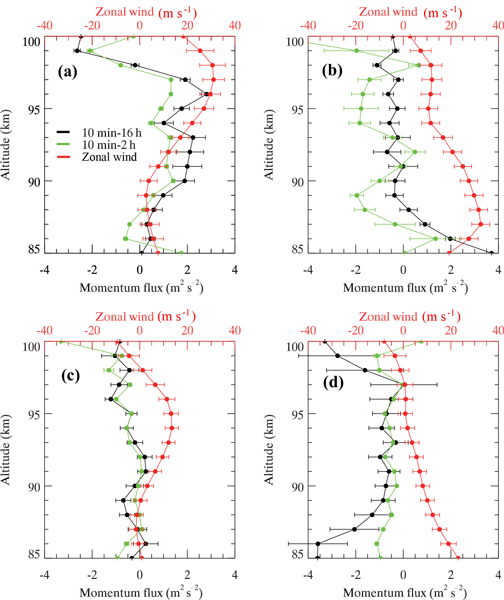 The anticorrelation between MF and zonal wind (U) suggests strong filtering of short-period GWs by semiannual oscillation U. The mechanisms that produce, destroy and transport nitric oxide (NO) in the Antarctic mesosphere and lower thermosphere are investigated in AIM-SOFIE satellite observations and compared to SD-WACCM simulations. During winter, NO concentrations are most similar while the altitude of maximum NO number densities is most separated. Even though the rate of descent is similar in both datasets, the simulated descending NO flux is too low in concentration, which reflects a missing source of NO. In the Alpine region, the most dense subnetwork of identical NDMC (Network for the Detection of Mesospheric Change) instruments can be found. With these instruments the mesopause temperature is derived each night. The data can be used for the investigation of the amount of energy which is transported by small-scale atmospheric waves, known as gravity waves, provided that the so-called Brunt–Väisälä frequency is known. Information about the variability of this parameter is provided here. Meteoric metals form metal layers in the upper atmosphere anandplay a role in the formation of middle-atmospheric clouds and aerosols. However, the total metal influx rate is not well known. Global Na datasets from measurements and a model are available, which had not been compared yet on a global scale until this paper. Overall the agreement is good, and many differences between measurements are also found in the model simulations. However, the modeled layer altitude is too low. The solar forcing dataset for climate model experiments performed for the upcoming IPCC report is described. This dataset provides the radiative and particle input of solar variability on a daily basis from 1850 through to 2300. With this dataset a better representation of natural climate variability with respect to the output of the Sun is provided which provides the most sophisticated and comprehensive respresentation of solar variability that has been used in climate model simulations so far. Simulations from eight atmospheric models have been compared to tracer and temperature observations from seven satellite instruments in order to evaluate the energetic particle indirect effect (EPP IE) during the perturbed northern hemispheric (NH) winter 2008/2009. Models are capable to reproduce the EPP IE in dynamically and geomagnetically quiescent NH winter conditions. The results emphasize the need for model improvements in the dynamical representation of elevated stratopause events. We have derived ozone and temperature responses to solar variability over a solar cycle, from 2002 to 2014 at 20–60 km and 48°S–48°N, based on a new dataset (SABER). These global results can be directly compared with 3-D models and will help in understanding not only the physical processes but also how they affect the Earth's climate. The simultaneous measurements of ozone and temperature will give added insight into the dynamics and photochemistry of the middle and upper atmosphere. This study was completed on D-region atmospheric model development. The sophisticated 3-D Whole Atmosphere Community Climate Model (WACCM) and the 1-D Sodynkalä Ion and Neutral Chemistry Model (SIC) were combined in order to provide a detailed, accurate model (WACCM-SIC) that considers the processes taking place in solar proton events. The original SIC model was reduced by mechanism reduction, which provided an accurate sub-mechanism (rSIC, WACCM-rSIC) of the original model. The state of the art Community Earth System Model, CESM1 CAM4-chem has been used to perform reference and sensitivity simulations as part of the Chemistry Climate Model Initiative (CCMI). Specifics of the model and details regarding the setup of the simulations are described. In additions, the main behavior of the model, including selected chemical species have been evaluated with climatological datasets. This paper is therefore a references for studies that use the provided model results. Two global models were used to investigate the impact of galactic cosmic ray (GCRs) on the atmosphere over the 1960-2010 time period. The primary impact of the naturally occurring GCRs on ozone was found to be due to their production of NOx and this impact varies with the atmospheric chlorine loading, sulfate aerosol loading, and solar cycle variation. GCR-caused decreases of annual average global total ozone were computed to be 0.2 % or less. 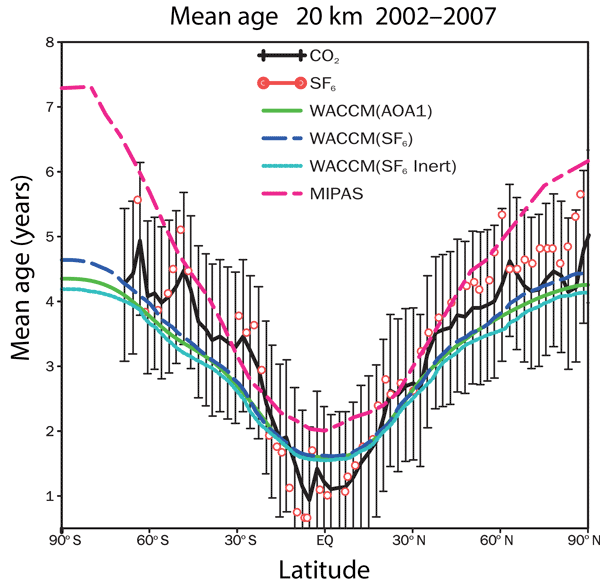 We compare concentration profiles of methane and nitrous oxide measured from MIPAS-ENVISAT and derived with a new retrieval setup to those measured by other satellite instruments and to surface measurements. For methane we use profiles measured by ACE-FTS, HALOE and SCIAMACHY; for nitrous oxide we use profiles measured by ACE-FTS, Aura-MLS and Odin-SMR for the comparisons. We give a quantitative bias estimation and compare the estimated errors provided by the instruments. Satellite data over the 11-year solar cycle from 2002 to 2014 show that the response of atmospheric temperatures are in phase with the sun's activity from 50 to 100 km. The ozone variations are also in phase with those of temperature between ~ 80 and 100 km but are mostly out of phase between ~ 50 and 80 km. This is consistent with the idea that dynamics are more in control from 80 to 100 km, while ozone photochemistry is more in control from ~ 50 to 80 km. Energetic particles from the sun produce NOx (=N+NO+NO2) in the mesosphere/lower thermosphere. The NOx can be transported downward in the stratosphere during polar winter where NOx eventually depletes O3. This entire chain is the so-called energetic particle precipitation (EPP) indirect effect. Here we show downward propagating negative stratospheric O3 anomalies during Antarctic polar winter. The O3 anomalies are caused by geomagnetic activity and show strong hints of the EPP indirect effect. This paper deals with the retrieval of atomic oxygen concentration profiles in the Earth's upper mesosphere/lower thermosphere region from SCIAMACHY observations of oxygen green line airglow emissions. Atomic oxygen is one of the most important chemical constituents of this atmospheric region, and long-term satellite data sets are rare. The paper includes a detailed description of the retrieval algorithm, an error budget, validation results and some first scientific analyses. Global concentration fields of Mg and Mg+ in the Earth's upper mesosphere and lower thermosphere (70-150km) are presented. These are retrieved from SCIAMACHY/Envisat satellite grating spectrometer measurements in limb viewing geometry between 2008 and 2012. 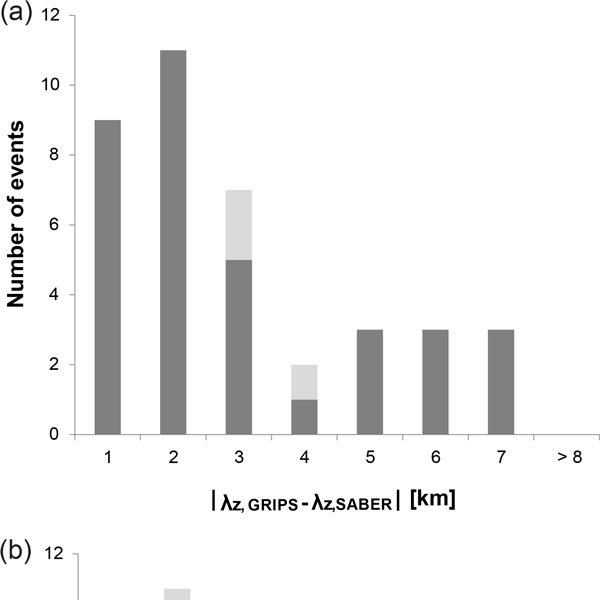 These were compared with WACCM-Mg model results and a large fraction of the available measurement results for these species, and an interpretation of the results is done. The variation of these species during NLC presence is discussed. 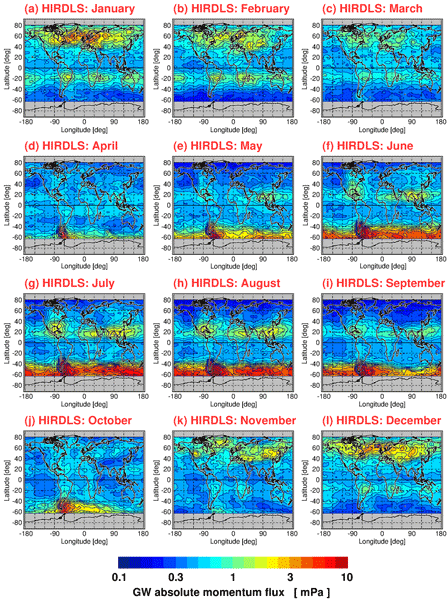 Akmaev, R. A., Fuller-Rowell, T. J., Wu, F., Forbes, J. M., Zhang, X., Anghel, A. F., Iredell, M. D., Moorthi, S., and Juang, H.-M.: Tidal variability in the lower thermosphere: Comparison of Whole Atmosphere Model (WAM) simulations with observations from TIMED, Geophys. Res. Lett., 35, L03810, https://doi.org/10.1029/2007GL032584, 2008. Bailey, S. M., Thurairajah, B., Randall, C. E., Holt, L., Siskind, D. E., Harvey, V. L., Venkataramani, K., Hervig, M. E., Rong, P. P., and Russell III, J. M.: A multi tracer analysis of thermosphere to stratosphere descent triggered by the 2013 stratospheric sudden warming, Geophys. Res. Lett., 41, 5216–5222, https://doi.org/10.1002/2014GL059860, 2014. Barth, C. A., Bailey, S. M., and Solomon, S. C.: Solar-terrestrial coupling: Solar soft X-rays and thermospheric nitric oxide, Geophys. Res. Lett., 26, 1251–1254, 1999. Barth, C. A., Mankoff, K. D., Bailey, S. M., and Solomon, S. C.: Global observations of nitric oxide in the thermosphere, J. Geophys. Res., 108, 1027, https://doi.org/10.1029/2002JA009458, 2003. Bender, S., Sinnhuber, M., von Clarmann, T., Stiller, G., Funke, B., López-Puertas, M., Urban, J., Pérot, K., Walker, K. A., and Burrows, J. P.: Comparison of nitric oxide measurements in the mesosphere and lower thermosphere from ACE-FTS, MIPAS, SCIAMACHY, and SMR, Atmos. Meas. Tech., 8, 4171–4195, https://doi.org/10.5194/amt-8-4171-2015, 2015. Bernath, P. F, McElroy, C. T., Abrams, M. C., Boone, C. D., Butler, M., Camy-Peyret, C., Carleer, M., Clerbaux, C., Coheur, P.-F., Colin,R., DeCola, P., DeMaziere, M., Drummond, J. R., Dufour, D., Eveans, W. F. J., Fast, H., Fussen, D., Gilbert, K., Jennings, D. E., Llewellyn, E. J., Lowe, R. P., Mahieu, E., McConnell., J. C., McHugh, M., McLeod, S. D., Michaud, R., Midwinter, C., Nassar, R., Nichitiu, F., Nowlan, C., Rinsland, C. P., Rochon, Y. J., Rowlands, N., Semeniuk, K., Simon, P., Skelton, R., Sloan, J. J., Souch, M.-A., Strong, K., Tremblay, P., Turnbull, D., Walker, K. A., Walkty, I., Wardle, D. A., Wehrle, V., Zander, R., and Zou, J.: Atmospheric chemistry experiment (ACE): mission overview, Geophys. Res. Lett., 32, L15S01, https://doi.org/10.1029/2005GL022386, 2005. Bermejo-Pantaleón, D., Funke B., López-Puertas, M., Garcia-Comas., M., Stiller, G. P., von Clarmann, T., Linden, A., Grabowski, U., Höpfner, M., Kiefer, M., Glatthor, N., Kellmann, S., and Lu, G.: Global observations of thermospheric temperature and nitric oxide from MIPAS spectra at 5.3 µm, J. Geophys. Res., 116, A10313, https://doi.org/10.1029/2011JA016752, 2011. Bilitza, D.: The international reference ionosphere-status 2013, Adv. Space Res., 55, 1914–1927, 2015.
de Wit, R. J, Hibbins, R. E., Espy, P. J., and Mitchell, N. J.: Interannual variability of mesopause winds over Ascension Island: Coupling to the stratospheric QBO, J. Geophys. Res., 118, 12052–12060, https://doi.org/10.1002/2013JD020203, 2013. Fell., C., Steinfeld, J. I., and Miller, S., Quenching of N(2D) by O(3P), J. Chem. Phys., 92, 4768–4777, 1990. Forbes, J. M.: Wave coupling between the lower and upper atmosphere: case study of an ultra fast Kelvin wave, J. Atm. Sol-Terr. Phy., 62, 1603–1621, 2000. Forbes, J. M. and Vial, F.: Semi diurnal tidal climatology of the E region, J. Geophys. Res., 96, 1147–1157, 1991. Forbes, J. M. and Vincent, R. A.: Effects of mean winds and dissipation on the diurnal propagating tide: An analytic approach, Planet. Space Sci., 37, 197–209, 1989. Forbes, J. M., Roble, R. G., and Fesen, C. G.: Acceleration, heating and compositional mixing of the thermosphere due to upward propagating tides, J. Geophys. Res., 98, 311–321, 1993. Friedrich, M., Pock, C., and Torkar, K.: FIRI-18 An updated empirical model of the lower ionosphere, J. Geophys. Res., 123, 6737–6751, https://doi.org/10.1029/2018JA025437, 2018. Funke, B., Ball, W., Bender, S., Gardini, A., Harvey, V. L., Lambert, A., López-Puertas, M., Marsh, D. R., Meraner, K., Nieder, H., Päivärinta, S.-M., Pérot, K., Randall, C. E., Reddmann, T., Rozanov, E., Schmidt, H., Seppälä, A., Sinnhuber, M., Sukhodolov, T., Stiller, G. P., Tsvetkova, N. D., Verronen, P. T., Versick, S., von Clarmann, T., Walker, K. A., and Yushkov, V.: HEPPA-II model–measurement intercomparison project: EPP indirect effects during the dynamically perturbed NH winter 2008–2009, Atmos. Chem. Phys., 17, 3573–3604, https://doi.org/10.5194/acp-17-3573-2017, 2017. GATS Inc.: SOFIE NO data, available at: ftp://ftp.gats-inc.com/sofie, last access: 21 January 2019a. GATS Inc.: SABER O data, available at: http://saber.gats-inc.com/data.php, last access: 21 January 2019b. Gómez-Ramírez, D., McNabb, J. W. C., Russell III, J. M., Hervig, M. E., Deaver, L. E., Paxton, G., and Bernath, P. F.: Empirical correction of thermal responses in the Solar Occultation for Ice Experiment nitric oxide measurements and initial data validation results, Appl. Optics, 52, 2950–2959, 2013. Hendrickx, K., Megner, L., Gumbel, J., Siskind, D. E., Orsolini, Y. J., Nesse Tyssøy, H., and Hervig, M. E.: Observation of 27 day cycles in the production and mesospheric descent of EPP-produced NO, J. Geophys. Res., 120, 8978–8988, https://doi.org/10.1002/2015JA021441, 2015. Hendrickx, K., Megner, L., Marsh, D. R., and Smith-Johnsen, C.: Production and transport mechanisms of NO in the polar upper mesosphere and lower thermosphere in observations and models, Atmos. Chem. Phys., 18, 9075–9089, https://doi.org/10.5194/acp-18-9075-2018, 2018. Herron, J.: Evaluated chemical kinetics data for reactions of N(2D), N(2P) and N2(A3Σ) in the gas phase, J. Phys. Chem. Ref. Data, 28, 1453, https://doi.org/10.1063/1.556043, 1999. Jones Jr., M., Emmert, J. T., Drob D. P., and Siskind, D. E.: Middle atmospheric dyanmical sources of the semiannual oscillation in the thermosphere and ionosphere, Geophys. Res. Lett., 44, 12–21, https://doi.org/10.1002/2016GL071741, 2017. Jones Jr., M., Drob, D. P., Siskind, D. E., McCormack, J. P., Maute, A., McDonald, S. E., and Dymond, K. F.: Evaluating different nudging techniques in the TIME-GCM: The 2010 sudden stratospheric warming period, J. Adv. Model. Earth Sy., https://doi.org/10.1029/2018MS001440, 2018. Kiviranta, J., Pérot, K., Eriksson, P., and Murtagh, D.: An empirical model of nitric oxide in the upper mesosphere and lower thermosphere based on 12 years of Odin SMR measurements, Atmos. Chem. Phys., 18, 13393–13410, https://doi.org/10.5194/acp-18-13393-2018, 2018. Knipp, D. J., Pette, D. V., Kilcommons, L. M., Isaacs, T. L., Cruz, A. A., Mlynczak, M. G., Hunt, L. A., and Lin, C. Y.: Thermospheric nitric oxide response to shock-led storms, Space Weather, 15, 325–342, 2017. Kockarts, G.: Nitric oxide cooling in the terrestrial thermosphere, Geophys. Res. Lett., 7, 137–140, 1980. 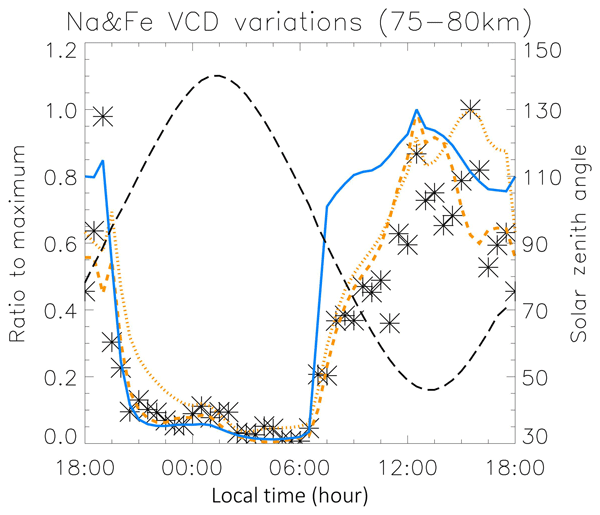 Marsh, D. R. and Russell III, J. M.: A tidal explanation for the sunrise/sunset anomaly in HALOE low-latitude nitric oxide observations, Geophys. Res. Lett., 27, 3197–3200, 2000. Marsh, D. R., Solomon, S. C., and Reynolds, A. E.: Empirical model of nitric oxide, J. Geophys. Res., 109, A07301, https://doi.org/10.1029/2003JA010199, 2004. Maute, A.: Thermosphere-Ionosphere-Electrodynamics General Circulation Model for the Ionospheric Connection Explorer: TIEGCM-ICON, Space Sci Rev., 212, 523–551, https://doi.org/10.1007/s11214-017-0330-3, 2017. McCormack, J., Hoppel, K., Kuhl, D, de Wit, R., Stober, G., Espy, P., Baker, N., Brown, P., Fritts, D., Jacobi, C., Mitchell, N., Ruston, B., Swadley, S., Viner, K., Whitcomb, T., and Hibbins, R.: Comparison of mesospheric winds from a high-altitude meteorological analysis system and meteor radar observations during the boreal winters of 2009–2010 and 2012–2013, J. Atmos. Sol.-Terr. Phy., 154, 132–166, https://doi.org/10.1016/j.jastp.2016.12.007, 2017. Meier, R. R., McLaughlin, B. M., Warren, H. P., and Bishop, J.: Atomic oxygen photoionization rates computed with high resolution cross sections and solar fluxes, Geophys. Res. Lett., 34, L01104, https://doi.org/10.1029/2006GL028484, 2007. Mlynczak, M., Martin-Torres, F. J., Russell, J., Beaumont, K., Jacobson, S., Kozyra, J., Lopez-Puertas, M., Funke, B., Mertens, C., Gordley, L., Picard, R., Winick, J., Wintersteiner, P., and Paxton, L.: The natural thermostat of nitric oxide emissin at 5.3 µ in the thermosphere observed during the solar storms of April 2002, Geophys. Res. Lett., 30, 2100, https://doi.org/10.1029/2003GL017693, 2003. Mlynczak, M. G., Hunt, L. A., Mast, J. C., Marshall, B. T., Russell III, J. M., Smith, A. K., Siskind, D. E., Yee, J.-H., Mertens, C. J., Martin-Torres, F. J., Thompson, R. E., Drob, D. P., and Gordley, L. L.: Atomic oxygen in the mesosphere and lower thermosphere from SABER: Algorithm theoretical basis and measurement uncertainty, J. Geophys. Res. 118, 5724–5739, https://doi.org/10.1002/jgrd.50401, 2013. Mlynczak, M. G., Hunt, L., Russell III, J. M., and Marshall, B. T.: Thermospheric climate indexes: Percentile ranges and adjectival descriptors, J. Atmos Sol.-Terr. Phy., 174, 28–31, https://doi.org/10.1016/j.jastp.2018.04.004, 2018a. Mlynczak, M. G., Hunt, L. A., Russell III, J. M., and Marshall, B. T.: Updated SABER night atomic oxygen and implications for SABER ozone and atomic hydrogen, Geophys. Res. Lett., 45, 5735–5741 ,https://doi.org/10.1029/2018GL077377, 2018b. Newnham, D. A., Clilverd, M. A., Rodger, C. J., Hendrickx, K., Megner, L., Kavanagh, A. J., Seppälä, A., Verronen, P. T., Andersson, M. E., Marsh, D. R., Kovács, T., Feng, W., and Plane J. M. C: Observations and modeling of increased NO in the Antarctic polar middle atmosphere, J. Geophys. Res., 123, 6009–6025, https://doi.org/10.1029/2018JA025507, 2018. Oberheide J. and Forbes, J. M.: Thermospheric nitric oxide variability induced by nonmigrating tides, Geophys. Res. Lett., 35, L16814, https://doi.org/10.1029/2008GL034825, 2008. 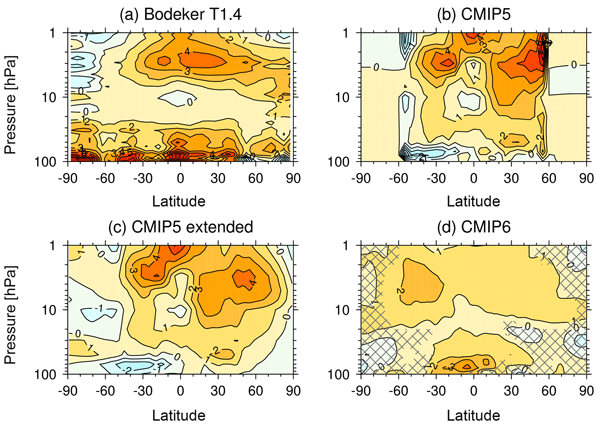 Oberheide, J., Mlynczak, M. G., Mosso, C. N., Schroeder, P. M., Funke, B., and Maute, A.: Impact of tropospheric tides on the NO 5.3 µm infrared cooling of the low-latitude thermosphere during solar minimum conditions, J. Geophys. Res., 118, 7283–7293, https://doi.org/10.1002/2013JA019278, 2013. Pavlov, A. V. and Pavlova, N. M.: Comparisons of electron concentrations in the ionospheric E-layer maximum in spring conditions obtained by calculations and Moscow ionosonde measurements, Geomagn. Aeronomy+, 55, 235–245, https://doi.org/10.1134/S0016793215020140, 2015. 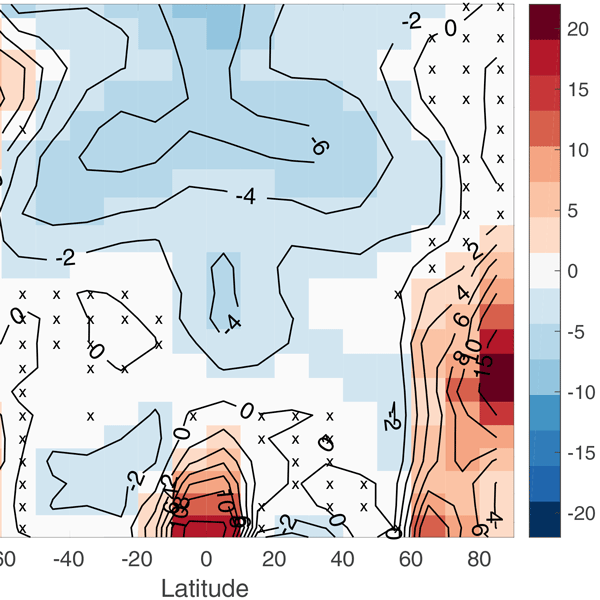 Pedatella, N. M. and Liu, H.-L.: The influence of atmospheric tide and planetary wave variability during sudden stratospheric warmings on the low latitude ionosphere, J. Geophys. Res.-Space, 118, 5333–5347, https://doi.org/10.1002/jgra.50492, 2013. Randall, C. E., Harvey, V. L., Holt, L. A., Marsh, D. R., Kinnison, D., Funke, B., and Bernath, P. F., Simulation of energetic particle precipitation effects during the 2003–2004 Arctic winter, J. Geophys. Res.-Space, 120, 5035–5048, https://doi.org/10.1002/2015JA021196, 2015. Roble, R. G. and Ridley, E. C.: A thermosphere-ionosphere-mesosphere-electrodynamics general circulation mdoel (TIME-GCM): Equinox solar cycle minimum simulations (30–500 km), Geophys. Res. Lett., 21, 417–420, https://doi.org/10.1029/93GL03391, 1994. Russell III, J. M., Gordley, L. L., Park, J. H., Drayson, S. R., Hesketh, W. D., Cicerone, R. J., Tuck, A. F., Frederick, J. E., Harries, J. E., and Crutzen, P. J.: The Halogen Occultation Experiment, J. Geophys. Res., 88, 10777–10797, 1993. Russell III, J. M., Bailey, S. M., Gordley, L. L., Rusch, D. W., Horanyi, M., Hervig, M. E., Thomas, G. E., Randall, C. E., Siskind, D. E., Stevens, M. H., Summers, M. E., Taylor, M. J., Englert, C. R., Espy, P. J., McClintock, W. E., and Merkel, A. W.: The Aeronomy of Ice in the Mesosphere mission: Overview and early science results, J. Atmos. Sol.-Terr. Phy., 71, 289–299, https://doi.org/10.1016/j.jastp.2008.08.011, 2009. Sheese, P. E., Strong, K., Gattinger, R. L., Llewellyn, E. J., Urban, J., Boone, C. D., and Smith, A. K.: ODIN observations of Antarctic nighttime NO densities in the mesosphere-lower thermosphere and observations of a lower NO layer, J. Geophys. Res., 118, 7414–7425, https://doi.org/10.1002/jgrd.50563, 2013. Siskind, D. E., Drob, D. P., Dymond, K. F., and McCormack, J. P.: Simulations of the effects of vertical transport on the thermosphere and ionosphere using two coupled models, J. Geophys. Res., 119, 1172–1185, doi:10.1002/2013JA019116, 2014. Siskind, D. E., Barth, C. A., and Roble, R. G.: The response of nitric oxide to an auroral storm, 1. Low and mid latitudes, J. Geophys. Res., 94, 16886–16898, 1989a. Siskind. D. E., Barth, C. A., Evans, D. S., and Roble, R. G.: The response of nitric oxide to an auroral storm, 2. Auroral latitudes, J. Geophys. Res., 94, 16899–16911, 1989b. Siskind, D. E., Barth, C. A., and Cleary, D. D.: The possible effect of solar soft X-rays on thermospheric nitric oxide J. Geophys. Res., 95, 4311–4317, 1990. Siskind, D. E., Strickland, D. J., Meier, R. R., Majeed, T., and Eparvier, F. G.: On the relationship between the soft X-ray flux and thermospheric nitric oxide: An update with an improved photoelectron model, J. Geophys. Res., 100, 19687–19694, 1995. Siskind, D. E., Barth C. A., and Russell III, J. M.: A climatology of nitric oxide in the mesosphere and thermosphere, Adv. Space Res., 21, 1353–1362, 1998. Siskind D. E., Sassi, F., Randall, C. E., Harvey, V. L., Hervig, M. E., and Bailey, S. M.: Is a high-altitude meteorological analysis necessary to simulate thermosphere-stratosphere coupling?, Geophys. Res. Lett., 42, 8225–8230, https://doi.org/10.1002/2015GL065838, 2015. Smith-Johnsen, C., Nesse Tyssøy, H., Hendrickx, K., Orsolini, Y., Kumar, G. K., Ødegaard, L.-K. G., Sandanger, M. I., Stordal, F., and Megner, L.: Direct and indirect electron precipitatin effect on nitric oxide in the polar middle atmosphere, using a full-range energy spectrum, J. Geophys. Res.-Space, 122, 8679–8693, https://doi.org/10.1002/2017JA024364, 2017. Solomon, S. C.: Numerical models of the E-region ionosphere, Adv. Space Res., 37, 1031–1037, 2006. Solomon, S. C.: The GLobal airglOW Model, GitHub, available at: https://github.com/NCAR/GLOW (last access: 21 January 2019), 2017. Solomon, S. C. and Qian, L.: Solar extreme-ultraviolet irradiance for general circulation models, J. Geophys. Res., 110, A10306, https://doi.org/10.1029/2005JA011160, 2005. Solomon, S. C., Bailey, S. M., and Woods, T. N.: Effect of solar soft-rays on the lower ionosphere, Geophys. Res. Lett., 28, 2149–2152, 2001. Sojka, J. J., Jensen, J., David, M., Schunk, R. W., Woods, T., and Eparvier, F.: Modeling the ionospheric E and F1 regions using SDO-EVE observations as the solar irradiance driver, J. Geophys. Res., 118, 5379–5391, https://doi.org/10.1002/jgra.50480, 2013. Warren, H.: A solar minimum irradiance spectrum for wavelengths below 1200 Å, Astrophys. J. Suppl. S., 157, 147–173, 2005. Warren, H., Mariska, J. T., and Wilhelm, K.: High-resolution observations of the solar hydrogen lyman lines in the quiet sun with the SUMER instrument on SOHO, Astrophys. J. Suppl. S., 119, 105–120, 1998. Yonker, J. D.: Contribution of the first electronically excited state of molecular nitrogen to thermospheric nitric oxide, PhD Thesis, Virginia Tech, Blacksburg, VA, USA, 2013. Zhang, X., Forbes J., and Hagan, M. E.: The longitudinal variation of tides in the MLT region: 1. Tides driven by tropospheric net radiative heating, J. Geophys. Res, 115, A06316, https://doi.org/10.1029/2009JA014897, 2010a. Zhang, X., Forbes, J., and Hagan, M. E.: The longitudinal variation of tides in the MLT region: 2. Relative effects of solar radiative and latent heating, J. Geophys. Res, 115, A06317, https://doi.org/10.1029/2009JA014898, 2010b.